dietfreebody | Stop dieting, start living! Toxic Parents: How do you know when it’s time to let go? Our parents are the ones who should love us the most. So we think and so we believe and in an ideal world, it would be true. In our hearts and in our minds, we WANT it to be true. Watch my free replay of my Toxic Parent Webinar Recording. Ready to start dealing with your toxic parent and get your life back? Book your free 20 minute Discovery Session with me on Skype. Got a toxic parent or know someone who does? Share my blog and let them know they are not alone and I would love to hear your comments! Why your Stories are Sabotaging your Relationships. What most of us don’t realize is that we don’t really respond to people. We respond to our stories about people, based on our theory about life and who we are and what we deserve. Here’s a common example of how this works: You have left your partner at home with the kids while you go off to do something. Hours later when you get home, the house is a mess. The dishes are unwashed, toys and clothes are everywhere and your partner is watching TV. You walk into the bathroom and there in the empty bath, is a towel that has been obviously used to clean up the floor after someone missed their aim at the toilet bowl and it is clear to you that it has been sitting there for hours. So here are the facts. Partner at home, house is messy, partner is watching TV and stinky, pee smelling towel is sitting in the empty bath. Your story about your partner and why you think they do what they do, takes over and you react to that story as if it is true and yet another argument is about to happen, perhaps the same old argument that has been going on for weeks or months or years. We stop reacting to the facts. We stop reacting to the person. We start reacting to our stories about the person. We do this because according to our stories, we think we already know. The only way to truly know what someone is feeling or thinking or why they do what they do is to ask them. The trouble is, that we don’t. In that moment when we step into our stories, we lose the ability to ask questions and have a conversation about what is really happening. 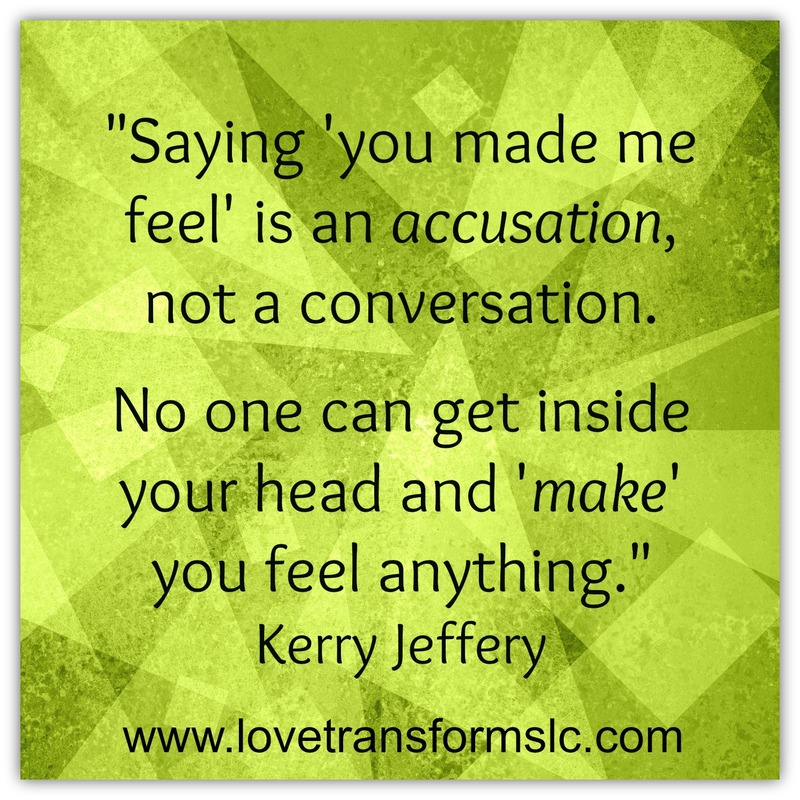 Instead of owning our feelings, we accuse other people of “making” us feel something, do something or believe something. The best way to have a conversation about an issue and step out of your stories, is to talk about the facts and issues and OWN your emotions. One is an accusation that will most likely get a hurt, defensive response. The other is your reaction and interpretation of what you are experiencing that the other person can respond to, with what the situation is for them. The more you step out of your stories, own your feelings and stick with the facts, the more open, honest and real your relationships and communication will be. Are you stuck in your stories of what might happen or what other people may think? Then book yourself in today for a Complimentary Consult with me today and let’s talk about how to get you unstuck. The Only Question You Need To Ask Yourself. What most of us don’t really realize is that to our subconscious mind, everything we think is real. When you imagine an event, your subconscious mind cues your body to create the chemical reactions that create your emotions including anxiety, happiness and everything else in between. Worrying is essentially telling ourselves a scary story that our bodies react to as if it were real and anyone who has ever been stuck in worry story, can testify as to the very real affect it has on our bodies and our emotions. So many of the things that we react to are really nothing more than a story in our heads. All of these types of thoughts whether it’s worry about what someone thinks of us or labeling ourselves and our behaviours, is just a story about what we imagine may happen or may be real. The more you play into the power of your story, the more you will believe it and you will react to your story as if it were real. We can make ourselves absolutely miserable with of our stories; anxious, resentful, sad and stuck. This story that I am creating in my mind that is causing me to feel this way, is it true? Do I know for certain that what I am thinking is real or is it just a story that I am telling myself about what might happen or what might be real? By challenging your story and asking is it true, you pull yourself back into the moment and all of the other possibilities. The only real way to know what someone is thinking or feeling is to ask them. If you are telling yourself a story about what someone else feels or thinks or may do, you are in the middle of your story and out of touch with what is real right now. Start asking yourself the question “is this true?” next time you find yourself stuck in a story that is making you feel anxious or miserable. The power of our stories always fades, when we get back to what is real, ask questions instead of imagining we know the answer and staying right here in the present moment. By doing this, your life will become so much more enjoyable, peaceful and happy. Are you stuck in your stories of what might happen or what other people may think? Then book yourself in today for a Complimentary Consult with me and talk about how to get you unstuck. Does acceptance really mean giving up? Any time that I talk to clients about the concept of acceptance, I immediately see their resistance and barriers start going up! This is because most people confuse acceptance with resignation. Often comes before acceptance, but it feels powerless. You hit the wall and resign yourself to the fact that things are the way they are but you feel that there is nothing that you can do to help yourself or change the situation. You may even believe that things can never, ever get better, that nothing ever works out for you and so you do the best you can to go on. Resignation feels heavy, depressing, sad, guilty and you can feel trapped. Understanding that YOU have choice. Acceptance feels powerful. You hit the wall, but you understand that even though you can’t change the people around you or the situation, you can change your own attitude towards yourself and what you do in your situation. You feel fat and frumpy. It doesn’t matter what you do, you just can’t seem to change your body. If you could just lose the weight, everything would be ok, but it just won’t budge. You are constantly complaining to your partner about your body and your weight and how unattractive you feel. It feels like it’s ruining your life and your health. You give up. You believe that there is nothing you can do to change the way you are. You stop taking care of yourself and sink into depression and apathy. You focus solely on how you look, not on how you feel, and you think you look fat and ugly. You have a litany of criticism constantly running through your head and it never seems to end. You say that you accept that this is the way it is but you increasingly feel bitter, resentful, hate yourself and compare yourself constantly to others and you feel powerless. You accept that this is the way that your body is right now and you decide that even if you never lose another gram, you are going to look after you. You start making fresh, healthy food that you enjoy. You throw out all the clothes that don’t fit and find ones that suit your body shape in colors and fabrics that you love. You take 100% responsibility for your health and make choices that decrease your stress and increase your happiness. You do more things that make you feel good. You accept that your body is really at your mercy, so you decide to do your best to make it’s job of keeping you strong and healthy, as easy as possible. You focus on how you want to feel instead of how you want to look. Acceptance is saying to yourself; “Ok, right now THIS is how it is. What can I do right now and in the future, to make this as easy, comfortable or better for ME as I can? How can I support myself more in this situation? What steps can I take to help myself? What resources can I use or call on? Who can I find to help me help myself? Acceptance is such a powerful and amazingly freeing attitude! If you need help with shifting from resignation and upgrading your acceptance skills, contact me. This brought tears to my eyes. Don’t diet. Love who you are. Why my body doesn’t trust me and why I am ok with it. My relationship with my body has never been an easy one. Quite frankly, I have spent most of my life hating it , feeling ashamed and disgusted by it, constantly criticizing it and seeing it as the enemy that was ruining my life. For the past three years, I have been focused on learning to love and accept my body just as it is right now, and a large part of that process has been about rebuilding trust in my body. Learning to trust that it will tell me what it needs to eat when it is hungry and that when I work with it, it will let me know when I have had enough. Learning to listen when my body says it needs rest or exercise and what foods makes it feel better and which foods it wants to let go. Learning to release my binge eating disorder and have a normal, healthy and guilt free relationship with food. As part of this process, what I hoped was that now that I was treating my body better and loving it and feeding it when it was hungry and moving it ways that it makes it feel good, that my body would begin to let go of some weight. In fact, I may even have gained some. I don’t weigh myself any more as there is nothing immediate I can do in this moment about my weight except continue to aim for my best possible health by eating what my body wants when it wants it, eating mainly fruits, vegetable and home cooked simple meals and enjoying my walks. I do believe that given enough time, my body will achieve the weight that it feels good at, as long as I continue to listen to and respect it. However, what I have recently realized is that even though I have decided to so magnanimously trust my body after all these years, that my body actually has no reason to trust me. I have starved it with rigid diets starting from when I was 9 years old and my worried parents took me to the Doctors to see if there was something wrong with me because of the weight I was gaining. For the next 40 plus years, I was either on a diet, off a diet or thinking about a diet, feeling fabulous if I lost weight and crushed when I didn’t, letting the number on the scales determine my self-worth and self-esteem. I have ignored my body when it was hungry because I had already eaten my allotted calories for the day and I wasn’t allowed to have any more food. I have pushed my body through all sorts of exercise classes and hated it when it couldn’t keep up or resented it when it got injured. I have stuffed my body with food through binge after binge, as each strict diet resulted in an equal and opposite desire to eat everything I had been depriving myself of. I felt virtuous and strong and worthy when I ate “good” food and guilty and weak and disgusted when I ate “bad” food. I have used food to numb my emotions and totally ignored how my body felt about all the food I gave it to digest and process and deal with and then hated it even more when it added more fat to my frame in self-defense. So even though I have decided to trust and honor my body, after decades of disordered eating, screwed up metabolism and years of weight loss and weigh gain, why should I even be surprised that to my body, this is probably just a lull in a series of eating and dieting wars? After all, bodies are so easy to silence. Bodies are so easy to ignore and objectify. 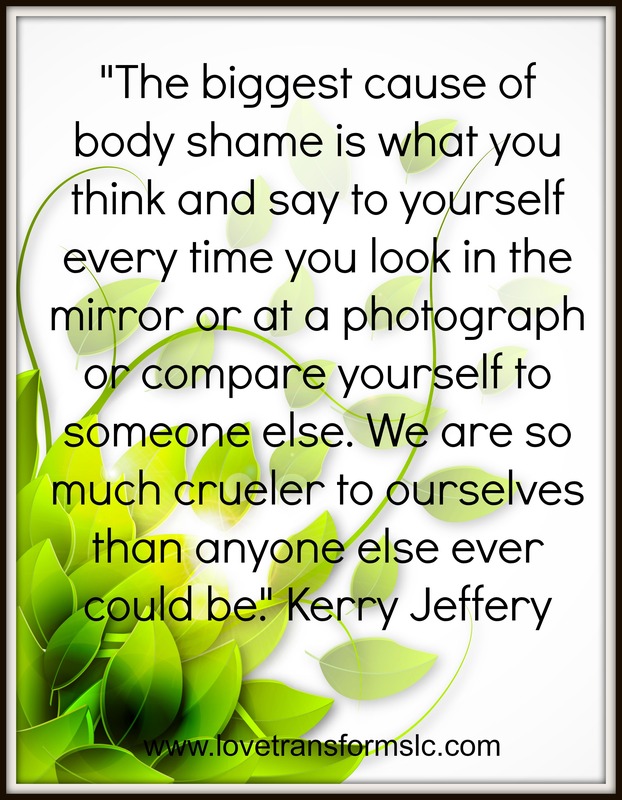 Bodies are so easy to blame for all that is not right in your world and your life and changing your weight gives you the illusion that it will fix everything that is wrong with your life. It doesn’t. In fact, weight loss can give you new pressures and anxieties to deal with that you have never imagined you would have. I have given my body absolutely no reason in the world to trust me. I have betrayed my body time and time again and left it to deal with the consequences of my lack of self-love and self-worth and self-care. So today, I am willing to accept and respect that my body has absolutely no reason to trust me and I am ok with that. For my own happiness, for my ongoing health, for the continuing joy and relief of having a guilt free, normal relationship with food and eating, I accept that my body may never trust me. It may want or need to hold onto this weight despite all the fabulous fruits and veggies we enjoy, despite that my body no longer wants dairy or gluten and so I no longer desire it, despite walking and stretching and spending so many glorious hours not obsessed with food and weight and calories and size and all that goes with it. My body has been under siege by me since I was a girl. As much as I wish I could have made peace with it earlier, that I could have never gone on that first, soul destroying diet that set the pattern of my life for the next 4 decades, it’s done. I hope one day my body will trust me but even if it never does, I promise both my body and myself to love it and me, just the way I am right now. To continue to focus on my health and know without doubt that health and happiness is possible at any size and to make the rest of my life, the best of my life. I trust my body and I am going to continue to listen to all the wisdom and knowledge it has without blame and without shame. I’m going to continue to do my best to give my body my appreciation, gratitude and respect for all that it does for me. More importantly, I’m going to ask my body to forgive me for everything I have done to it and for all the hatred and disgust I have given it over the years and see what happens. I hope one day, it will understand that the days of diets and binging are done and we can truly have peace with each other, but that is totally up to my body to decide. Right in this moment, I am really good with that. It seems only fair after what I have put my body through. How about you, do you trust your body and do you believe that your body trusts you? Want to know more about my Diet Free Body Programs that focus on dissolving body shame, teaching mindful eating techniques and creating a normal, healthy and guilt free relationship with food and eating?